Monday is the day! The day we all get to cast on for our Wadena shawl for the KAL we are hosting. We have all been very busy around here playing with yarn choices and different color ways. I think most have us have made our final decisions - but there may be a last minute substitution…or two. I decided that I wanted to make a lighter weight version of the shawl, so I am using Fresco held single in three colors (Pea Pod, Gray Stone and Icy Teal). Since I am using a yarn with a smaller gauge I’ll be doing a little math this weekend to figure out how many extra repeats to make and then how many stitches to pick up to have the shawl be the same length as the original. Our Sales Director, Heather is also using Fresco held single. She chose Icy Teal, Passion Fruit and Gray Stone as her colors. Our shawls will have a similar color feeling, but still be very different, since our main color is different. 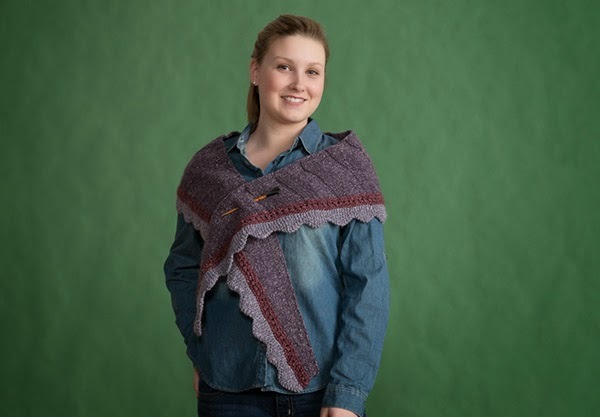 Another difference will be that she likes a smaller shawl that just sits on her shoulders, so she is going to be making hers with fewer repeats than the pattern calls for. Betsy, the owner of CEY, has decided to make hers using the Majestic Tweed that the pattern calls for. She wears a lot of earth tones and wanted a shawl that will work with a variety of different outfits. She will be using Brick, Charcoal as her trim colors and Sage as her main color. Cheryl, who works in our outlet store, has also decided to make her wrap in Majestic Tweed. She chose Sapphire Blue, Ballerina and Cognac as her colors. Planning ahead, she is making her Wadena to give as a gift this holiday season (I am really impressed by her motivation to get started on her gift giving knitting, btw). I feel a little bad for Tonia, a member of our design team. Because she is allergic to angora, so she can’t use Majestic Tweed. But at the same time I don’t feel too bad for her because she is going to knit the wrap in Wynter and Blackthorn, which will be stunning. She chose Crimson and Bright Green in Wynter as her trim colors and Seal in Blackthorn as her main color. Another member of our team that is joining the KAL is Andi in Customer Service. While she loves the shawl, she’s not a big fan of the color blocking. Plus she wanted a lighter weight shawl. Deciding to make the shawl using one strand of Alpaca Sox in Aztec Gold is going to give the piece a whole different look. It’ll be exciting to see her piece as it progresses. And last (but certainly not least) Linda, who does a variety of things (including coordinating the sample knitting, putting kits together and helps with all the miscellaneous things that go on in a warehouse) has decided to make hers out of Majestic Tweed in Lavender and Ballerina with Espresso as her main color. I think the best part of a Knit-A-Long like this is seeing all the different combination people come up with. It’s very rare that two projects look exactly the same. Different color combinations + different fibers = a kazillion different possibilities. And I can’t wait till Tuesday at lunch to see everyone’s progress at the lunch table. This is going to be fun! Have you got everything together for the KAL? You can find all the information you need, including the guidelines here. 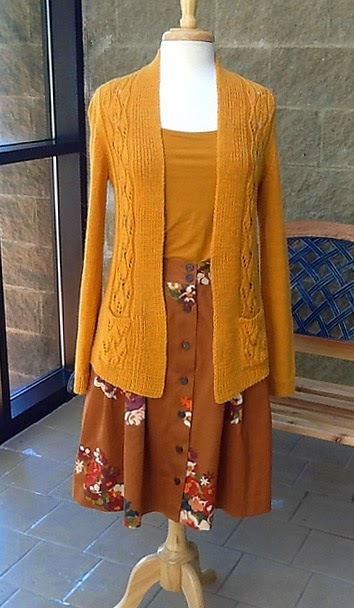 By now many of you have seen that our very own Cheryl (who works in our outlet store) had a FO featured on Ravelry last week in the Community Eye Candy: Yellow! section. We honestly couldn’t be more proud. Ironically, I had already planned a post on her piece. It was meant to be a WIP entry, but she knits so fast, she finished before I had a chance to talk about it! And when the folks at Ravelry saw it, they published it right away. I have mentioned Cheryl on the blog in the past. She is by far one of the fastest knitters I know. She will tell you that she is not a very fast knitter, just very dedicated. Whatever the reason, she turns out finished pieces at an alarming rate. 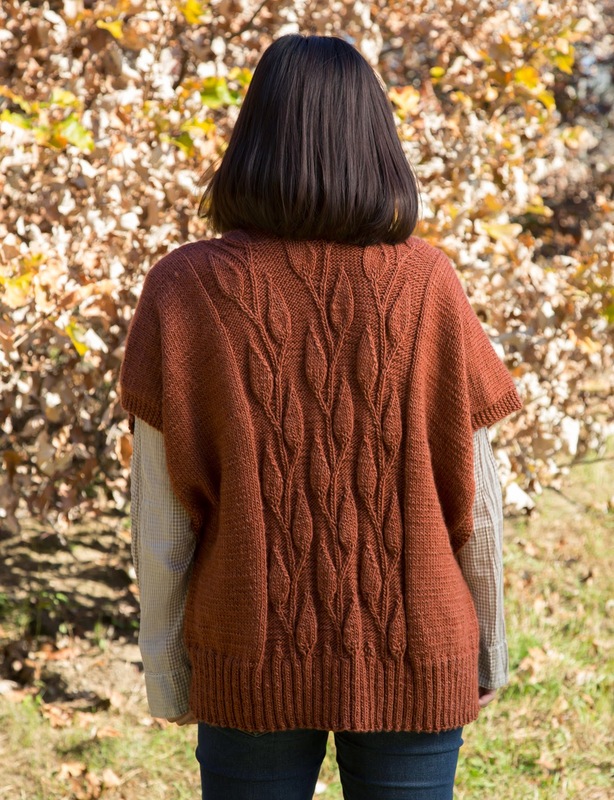 This week I am really jealous because she recently finished her Indian Summer from Autumn Leaf in Soft Linen. She was very focused on this project and had it finished in just over two weeks! She told me that it went so fast in part because the lace pattern is really intuitive and was just the right amount of break from knitting the stockinette portion. Like the rest of us, Cheryl doesn’t enjoying doing a gauge swatch. She gets excited about a project and wants to cast on and go, go, go! In this case she got lucky and was able to use her pocket lining as a swatch. It was a two for one! For many of us, knitting stockinette is very meditative or zen like. For Cheryl it is pure torture. To break up the ‘boring’ (her word, not mine) stockinette sleeves, she knit one front, then one sleeve, the other front and finished with the second sleeve. That way she didn’t have to ‘work two boring sleeves, one right after the other’ (again…her words, not mine). As you can see she was so excited about this project that she started sewing it together before all the pieces were knitted. One of the many great things about Soft Linen is that it really is a year-round yarn. Even though it is a long sleeve cardigan, she has been able to wear it already, on a cool New England summer day! I am also very proud of Cheryl for stepping outside of her color comfort zone with the gold color she chose. That’s not a very easy thing for many of us. She was a little surprised when she realized how many things she will be able to wear with her new gold cardigan. Everyone loves a sneak peek, right? We all know that one of the best parts of going to the movies is seeing the trailers for upcoming movies (and maybe the popcorn). I know the same is true with knitters and patterns. We all want to see what is coming up (so we can start dreaming about what we want to cast on next). In that spirt, I decided to show you one of the shawls in our upcoming collection - Wadena. 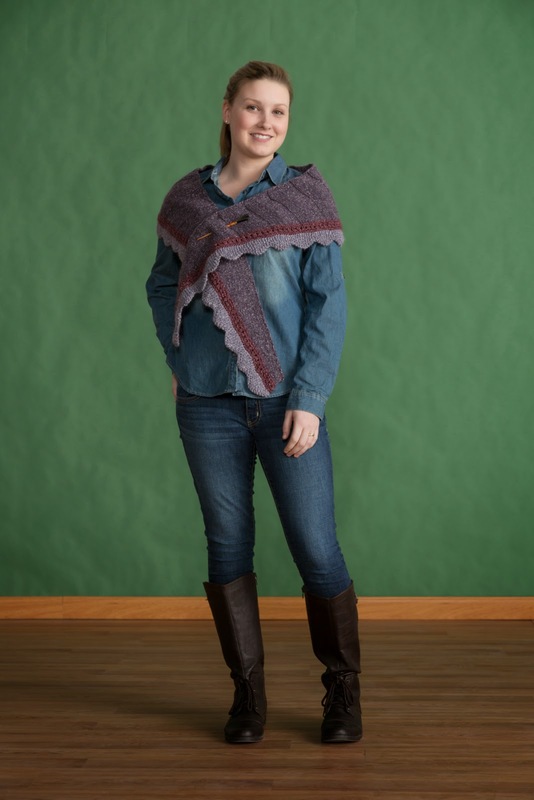 Wadena (part of our Classic Fall collection, due out in September) is a crescent shaped shawl knit in three colors of Majestic Tweed that is simple, fun and stylish - the kind of wrap that everyone will want to include in their wardrobe. Something to throw on as you are running out the door on cool September mornings that are coming our way soon. Or maybe as an accessory to an outfit for those of you who work in cold offices. And of course - as a cold weather accessory that brings a pop of color to a traditional coat. After many of us here at the office of Classic Elite Yarns decided to make the Wadena for ourselves, we thought it would be fun to make it an Office Knit-A-Long during the month of September. And then it hit us - why not invite all of you to join us! I can almost see you guys clicking over to Ravelry to download the pattern – but don’t go quite yet…I have more to tell you about the KAL. A few of you are probably thinking ‘That’s a beautiful shawl…but I am allergic to Angora’ or ‘I’m not sure if my LYS carries Majestic Tweed.’ That’s ok. You can still join us. You can use any current CEY yarn to knit your shawl and still qualify for the KAL. Our design team has given us a few suggestions for substitutions - Blackthorn, Chalet, Chateau, La Gran, MinnowMerino or Wynter. 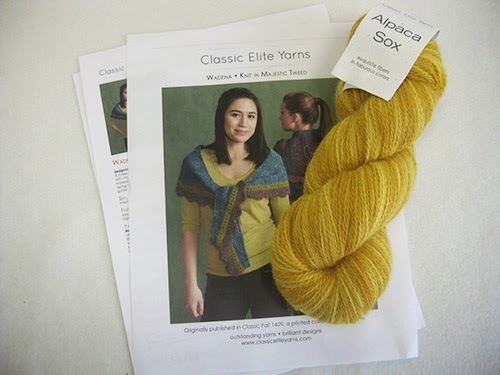 You can also double a yarn like Alpaca Sox or Fresco to get gauge. Or even still…knit it at a smaller gauge, like I am (Fresco single). My shawl will be a little smaller, but that’s ok because it’s a shawl. In other words…there are a lot of options! You know what else is great? There are three exciting prizes! Winners will be drawn at random from all qualified participants. Grand Prize — Copy of Unwind (CEY's October book) and sweater quantity of yarn from one of the patterns in the book, winner's choice*. Second Place — Copy of Unwind and three hanks of MinnowMerino (enough to make the single loop version of the Chillax cowl featured in Unwind) in winner's choice of color*. Third Place — Copy of Unwind. Cast-on date is Sept 1 and the project must be completed by Sept 30. Must use the Wadena pattern, with no more than 3 modifications to the pattern (i.e. changing yarn, gauge or color blocking). You are required to use a current CEY yarn (see list of other suggested yarns above). Knitters must upload their project to Ravelry with the tag WadenaKAL. Participants are required to upload a WIP and an FO picture to their Ravelry listing, no later than Sept 30 to qualify. There will be a thread for the KAL in CEY's Ravelry group. We encourage participants to follow along to discuss their projects, see everyone's progress and join the fun! Winners will be drawn at random from qualified participants. Now is the perfect time to jump over to Ravelry, download the pattern and head over to your LYS to collect your supplies. 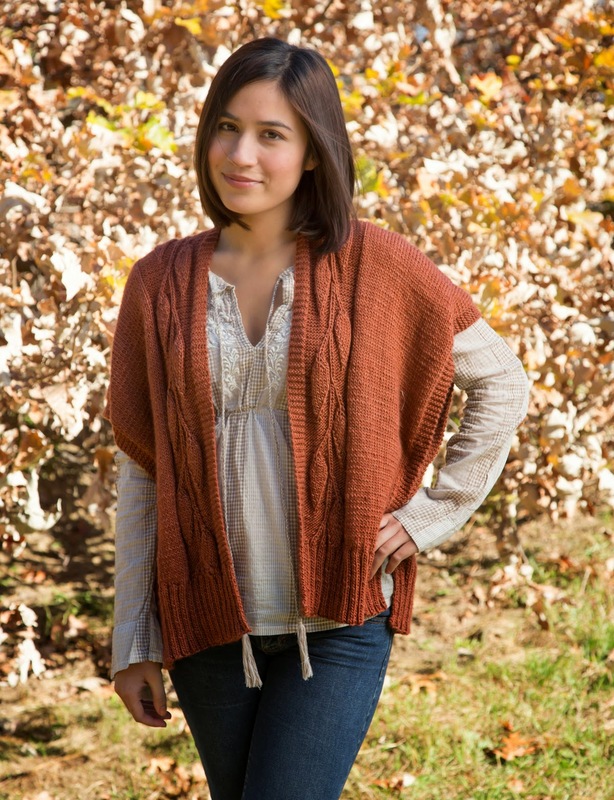 For our book Autumn Leaf, Therese Chynoweth designed a beautiful lacey shrug that is a versatile layering piece. I asked Therese to tell us a little about how she came up with the idea for Cornucopia and to take us through her process. 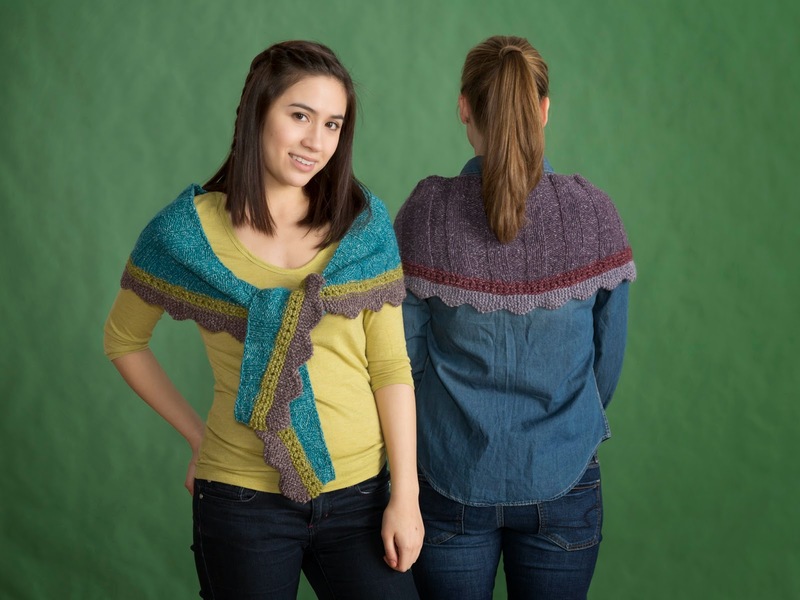 Cornucopia is a shrug that I've wanted to design for a while. Knit in Fresco, this shrug is simple, elegant and ethereal. Although it took some time to work out the details, I'm definitely pleased with the result. Most shrugs are worked in one piece, either from side-to-side, or from the bottom up. Others are worked flat like a large scarf, and then seamed at the underarms. Another construction method is worked from cuff-to-cuff. Although the latter is my favorite shrug construction, something has always bothered me about it. While being easy to work and has minimal finishing (always a plus in my book), this method of construction never seems to fit quite right. Usually it’s too tight in the front at the shoulders and under the arms. I started thinking about the best way to solve this fit problem. I decided to try working each sleeve separately to the armhole and put on holders. I then worked the back of the shrug. Then I joined the three pieces together and worked the balance of the piece, shaping it like a raglan sweater. I kept the front edges of the sleeves straight to retain the look of a usual shrug but tapered the back slightly below the armholes to maintain a clean fit across the back and shoulders. There's no saggy bag at the lower back, either. I wanted to use a lace stitch pattern that would be easy to work while at the same time would accommodate the decreases of the raglan shaping on the back. The Fern Lace was my first choice – it's pretty, feminine and easy to memorize. I added a narrow faggoting panel and twist stitch between halves of the lace for a little extra interest. The undulating bottom edge was one of the features that drew me to the pattern. The sleeves are worked straight up from the cast-on, creating a loose, flowing look, in keeping with look of the side-to-side shrug. I designed Cornucopia with extra-long sleeves, but I think this shrug would also be adorable with ¾-length sleeves (just knit a few less repeats of the lace pattern). I wanted the back of the shrug to have a simple feel to it, but didn’t want it to be completely plain. So I added one repeat of the Fern Lace pattern to tie the sections together. It also adds the undulating edge to the back. I decided to do just a few rows of 1 x 1 rib with eyelets along the edges of Cornucopia to ensure the edges didn’t roll. I wanted to be careful not to overwhelm the piece with too much edging. This lacey shrug is really an elegant piece with a feminine look. It is easily customizable by shortening the sleeves or changing colors and is simple to finish with no seams. It's a shrug that will look great on just about any body shape. Can't get much better than that! There is no doubt in anyone’s mind at Classic Elite Yarns who Betsy’s favorite designer is. Eileen Fisher, hands down. Betsy loves the classic and sophisticated pieces that all have a way of working together – from one season to the next. The only thing missing from her Eileen Fisher wardrobe was a hand knit sweater. And then it happened. 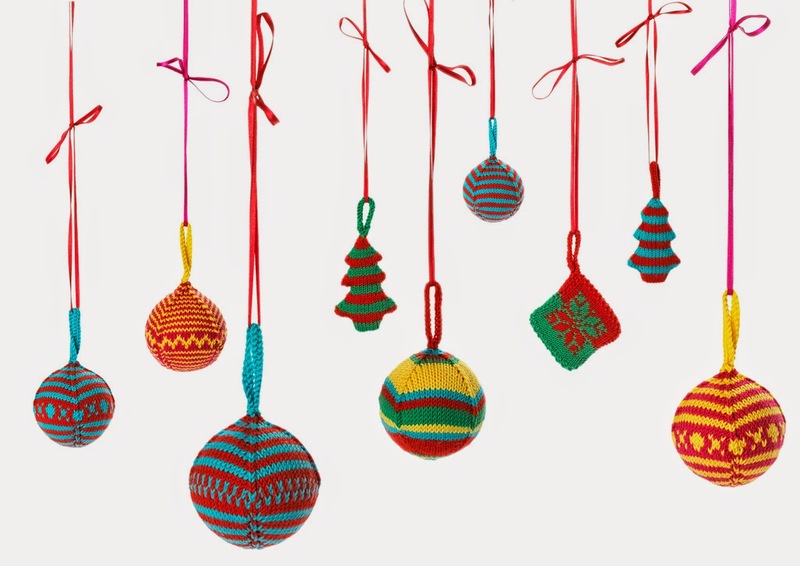 We found out that Vogue Knitting was publishing a pattern that Eileen Fisher designer. And in CEY Sprout no less! After taking a mental stock of her wardrobe, Betsy decided that she wanted to make the long sleeve dolman pullover in Tawny Port. This earthy brown with red undertones is going to complement everything in her closet. It will go with blacks, greys, other neutrals, greens, blues …you name it. Plus it’s a great transitional color. 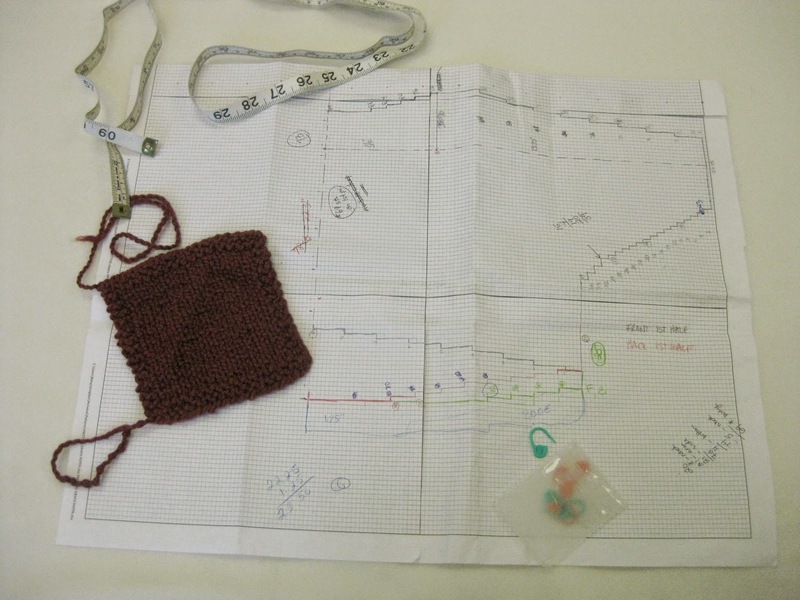 Being a diligent knitter, Betsy made a gauge swatch and reviewed the pattern before casting on. She also took a close look at the schematic. It was then she decided to make a few modifications to the pattern before beginning. While she really likes the high-low hem on the pattern, she wanted the front to be the same length as the back and the scoop on the hems to be a little less dramatic. This will make her finished piece a little more timeless, while remaining true to the trend. Some things are easy to adjust as you knit – make the sleeve a little longer, use a 2 x 2 rib instead of a 1 x 1. But since the sweater is knit side-to-side, it is best to make these adjustments to the pattern prior to casting on. She printed some knitter’s graph paper that she found on the web and set to adjusting the pattern. It didn’t take her long to map everything out and cast on. It also didn’t take her long to come to the conclusion that removable stitch markers were going to be a key element for successfully knitting this sweater. As you can see below, she is putting a stitch marker in every increase along the top sleeve edge. This is helping her keep track of where she is and how often she needs to increase. Betsy has been plugging away at the sweater and is about half way done with the front and it won’t be long now until she is casting on for the back. She even sent her husband in one day when she was working from home to get more yarn because she was afraid that she was going to run out. I can’t wait to see the finished piece. Not only is it going to look great on her, it’s just so…’her.’ I have a feeling we will be seeing a lot of it around the office once she is finished. Eileen Fisher in Vogue Knitting! We are always excited when a knitting magazine contacts us and asks to use our yarn for an editorial piece. Usually when they ask for yarn they tell us what publication it is for and a very basic description. 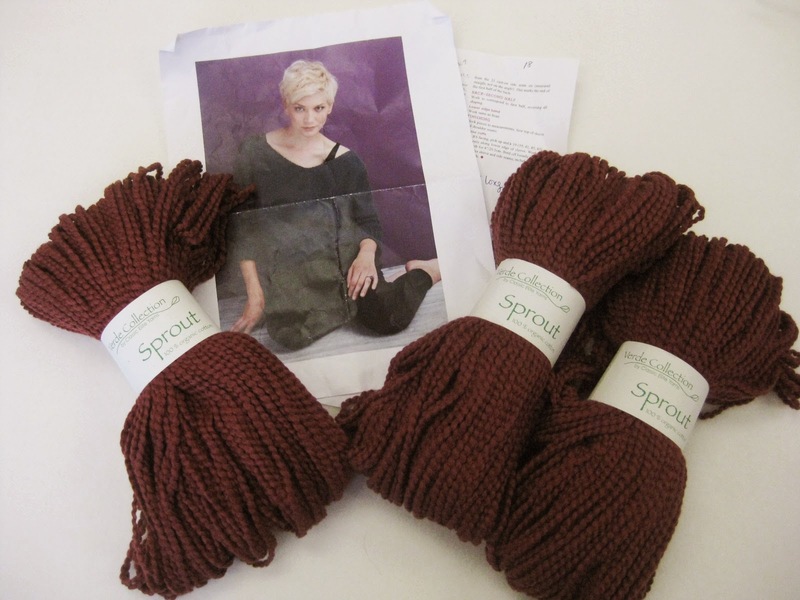 For example Vogue Knitting contacted us last February and asked for a bag of Sprout in two colors (Olive Leaf and Prune) for a pullover that would be published in the Fall 2014 magazine. We sent them the yarn and waited. And waited. And impatiently waited. A few weeks back we got the news. Not only was it going to be a pullover, it was going to be a designer piece. And not just any designer…but Eileen Fisher! Eileen Fisher is known for elegance and simplicity. And her design in the new Vogue Knitting does not disappoint! 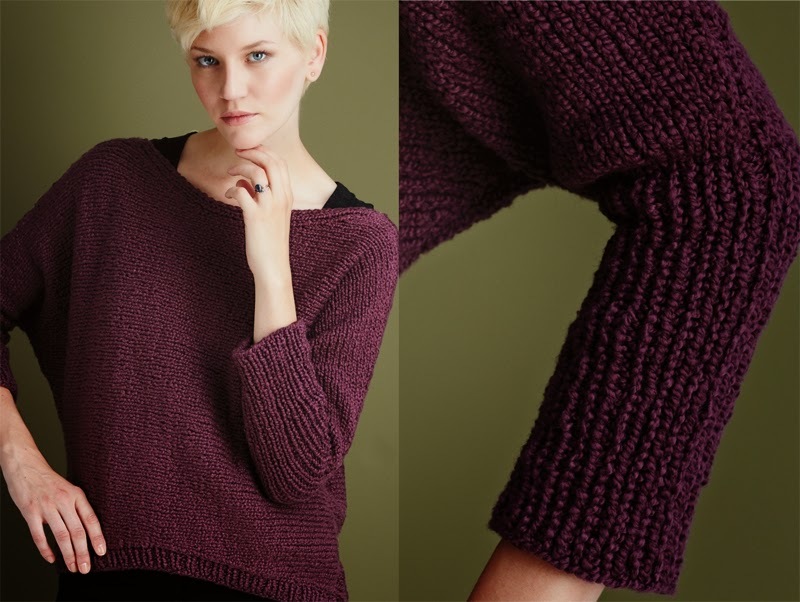 This loose-fitting dolman pullover is worked sideways (from cuff to cuff) in two pieces. 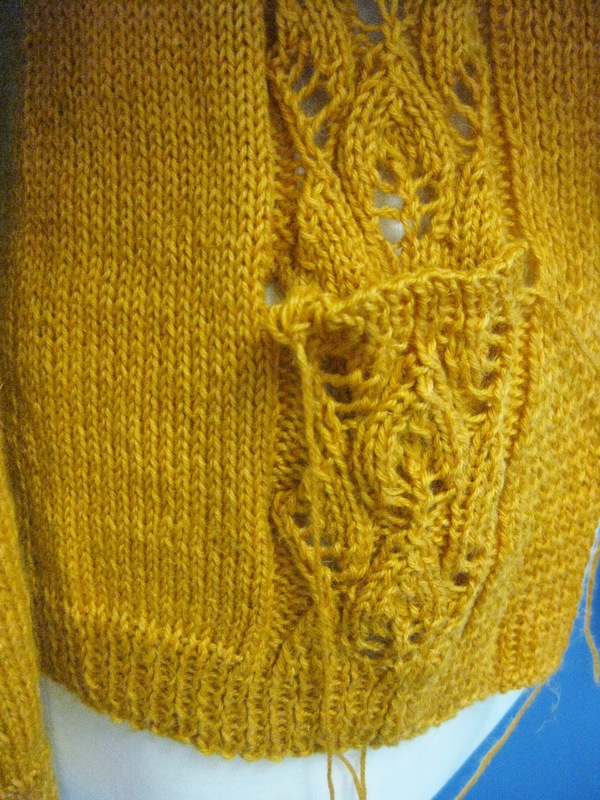 After seaming the two pieces together, stitches are picked up around the cuffs and knit in a 1 x 1 rib in the round. The pullover also sports a high-low hem, seen on many trend alerts this fall. While we love the colors that Vogue Knitting picked, we couldn’t help but wonder what the pullover would look like in other colors. We picked a few that are trending for fall and asked our graphic designer (with permission from Vogue Knitting) to recolor them for us, just so we could see more great possibilities! 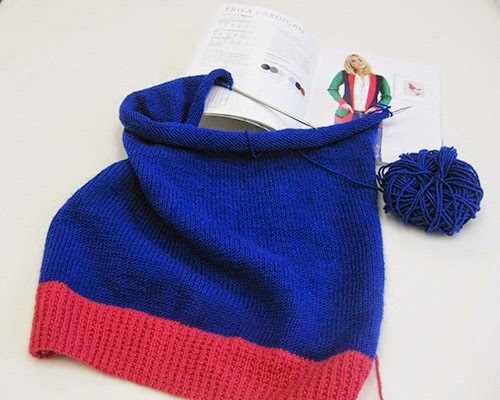 Here is an additional tip for you – if you knit with Seedling doubled, it is the same gauge and drape as Sprout. Yep…so that means you have even more options when you go to your LYS to pick out your colors. The other day I was walking through a major chain store and noticed they were putting out Halloween candy. How can that be? It’s not even Labor Day and the Halloween candy is being displayed! But it got me thinking about the holidays and how they will be upon us shortly. In fact there are less than 20 weeks left until Christmas. Yikes! This year I am going to be ready. I swear I am. Really. That means I need to start thinking about my Christmas knitting now. I have two sets of friends who got married this year and they will have their first holiday traditions with their own blended families. I would imagine that this will include a bigger tree that the mini ones they have had in the past, which means they will need more ornaments to fill the branches. So as soon as I saw the ornament kits from MillaMia, I knew what I would be making them for the holidays. One of my friends is a little more traditional, so for her I will be using the Classic kit. Scarlet, Snow, Midnight and Forget Me Not are the four colors that will adorn her tree this year (and hopefully many more). My other friend is a little bolder with her color choices, so for her ornaments I will use the Bright kit. Here the traditional colors of Christmas (Scarlet and Grass) are punctuated by Peacock and Daisy Yellow. Each of the kits comes with four balls of Naturally Soft Merino in the colors listed, above and four ornament patterns - all packaged in a nice container. 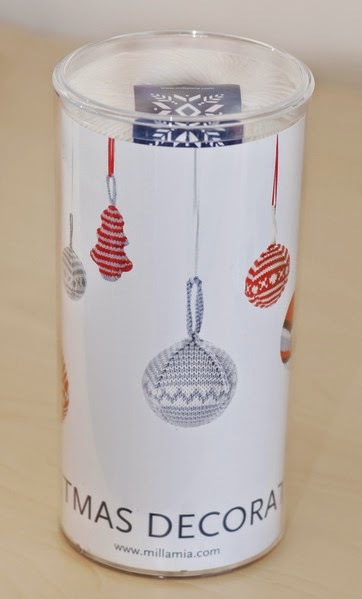 The kit will make at least seven ornaments, in different combinations. 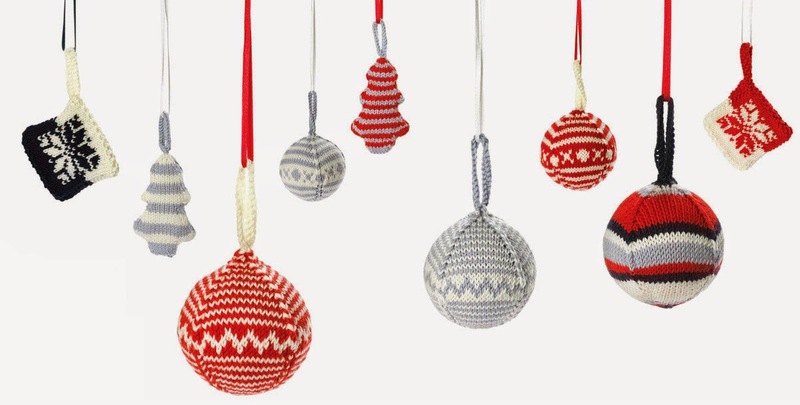 Because each of the ornaments is small, they will knit up pretty quickly. I have a feeling it will be one of those things that once you finish one, you will want to cast on for another one right away. Kind of like eating M&Ms, you can’t stop with one. It’s a good thing these will go quickly, because they aren’t the only ones on my Christmas knitting list. I have another friend who recently had her first child. And there is no stocking that will be good enough for him…unless it is hand knit by his honorary auntie. I think I am going to make him the Snowflake Stocking (also from MillaMia) on the left. The Fair Isle motif is the only section that you need to pay close attention to, so it will be good TV knitting. 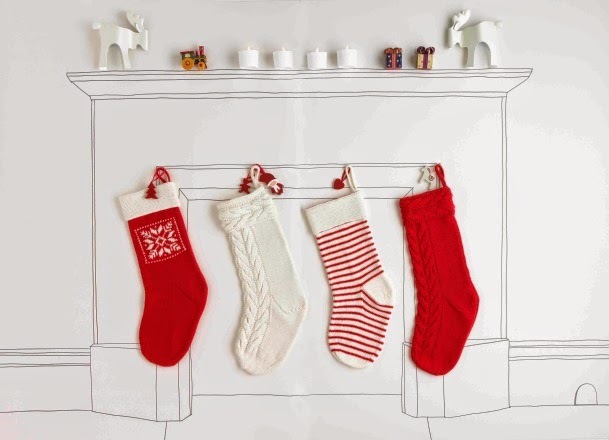 And of course his parents can’t have stockings that aren’t as nice as his, so each of them will be getting a cabled stocking – one in Scarlet and the other in Snow. Pro tip – if you are making a stocking for a new child and you are fairly certain the parents plan on more than one child, it might be a good idea to make more stockings than the one you need this year. That way in a few years all you have to do is pull it out of your closet, give it a steam and wrap it up! I did this once before and found it very helpful. One difference between working at a yarn company and working in a traditional 9 to 5 job is that not only is it completely acceptable to have a knitting project (or two) in the drawer of your desk, it’s the norm. A while back Heather, our Sales Director, decided that she wanted to have something that she didn’t have to carry back and forth every day and just have at the office for lunch time and meeting knitting. As inspiration, Heather remembered back to the industry trade show last year and the cardigan one of the MillaMia ladies was wearing – the Erika Cardigan. It seemed like the perfect knit, and the Naturally Soft Merino it called for was a yarn she’d wanted to use for a while. When it came time to pick colors, Heather started pulling yarn and polling the lunch table for opinions on color combinations. She really wanted to use last year’s limited edition colors – Cobalt and Lime – but wasn’t sure what to use as her third color. We, I mean she, eventually decided that the Fuchsia would be the best compliment. The good news is that this sweater is a contemporary take on a classic sweater and whenever Heather finishes (be it two months from now or two years) it will still be relevant and fashionable. In fact she is already talking about making another one, but in more toned down colors like the alternate version shown in the book. There are so many colors of the Naturally Soft Merino from MillaMia that there are tons of different color combinations for this sweater. Any of which would look great. Have you made the Erika Cardigan? We would love to see your color combination! Introducing Pumpkin and Teal – MillaMia’s Limited Edition colors for Fall 2014 in Naturally Soft Merino! 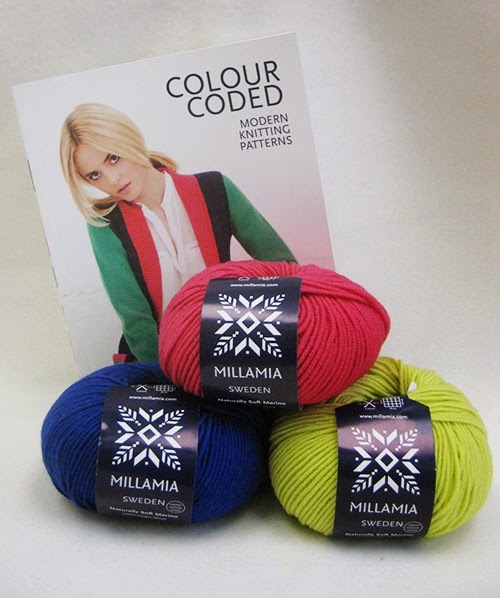 MillaMia had all the pieces from the Flight of Fancy Collection re-knit to showcase the new colors and to show how striking they look combined with the core color range for even more color combinations. Cowls have been all the rage the past few years – they are easy projects to knit on the go and are a fun and stylish addition to anyone’s wardrobe. 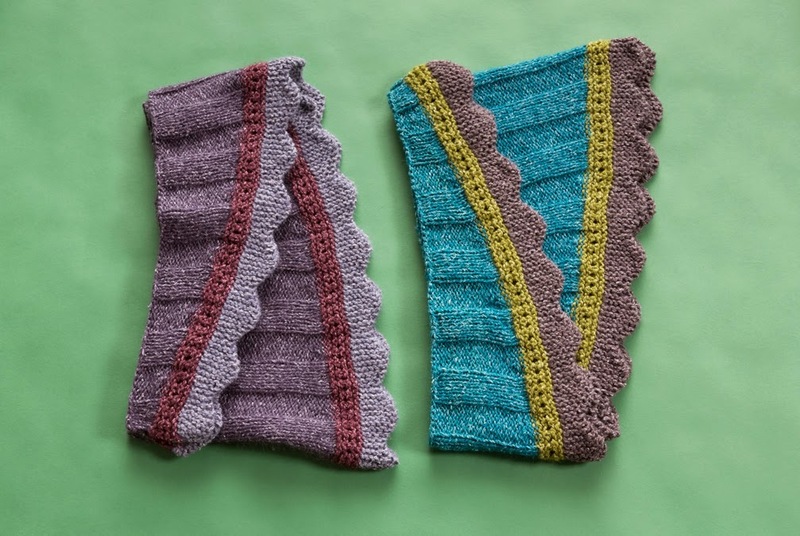 Using the same cable pattern as the cardigan above, the Vanessa Cowl is knit side-to-side using the main color and then stitches are picked up in the contrast color. I love the way the pop of color peeks out of the cowl. It’s also completely reversible, which makes it easy to switch up on those days when you feel like you need a little change. Another popular trend is color blocking. And I think it is here to stay (at least for a little while). So why not embrace it with the Larissa Top? This top takes that classic pullover sweater and adds a bit of whimsy and fashion to it. The front is striped using three different colors (Pumpkin, Midnight and Putty). The balance of the sweater is knit in blocks of color. The keyhole on the back is outlined with the main color from the front for that added je ne sais quoi detail. We all love great kids sweaters and the versatile cardigans included in this book, shown here in the new colors, are perfect for the fall season ahead. The Luca Cardigan might just be the perfect back-to-school sweater. It’s a color blocked V-neck sweater with pockets. Make it in your child’s (grandchild’s, niece’s nephew’s…you get the idea) favorite colors or even their school colors to show their team spirit. Or with a few more girly details, the Lucia Cardigan might be the one for your special girl. Also color blocked and with pockets, this cardigan is an open front crew neck cardigan with an optional bow at the center front neck. But the best part of these cardigans? There is an optional chart for the backs that feature bats. 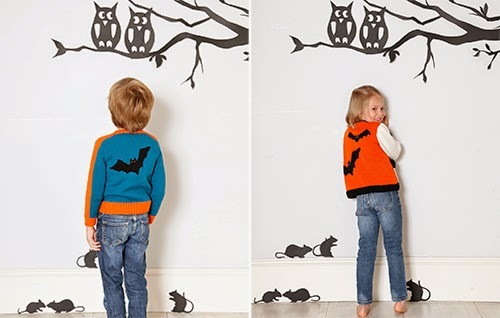 Perfect for the Halloween enthusiasts in your family! The charts can be worked in Intarsia or in duplicate stitch. All the pieces in Flight of Fancy would look great in any of the Naturally Soft Merino colors available. There are so many wonderful colors to choose from, the hardest part might be picking the right combination for you (or your loved ones). One of the staff favorites at Classic Elite Yarns is Soft Linen and for good reason. Soft Linen is a wool, alpaca and linen blend that makes a gorgeous fabric, perfect for year round garments. The stitch definition is spectacular. Simple stockinette really shines and lace really pops. 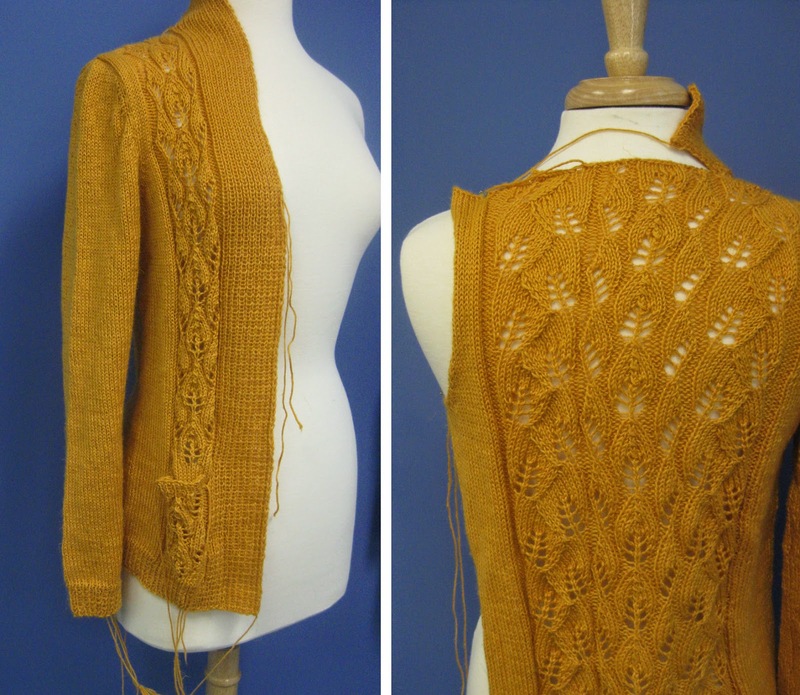 When our design team was creating the feel of our newest book, Autumn Leaf, designer Tonia Barry knew she had to make a cardigan in Soft Linen. I <3 the Indian Summer cardigan. It’s the perfect blend of stockinette and lace knitting - a little stockinette, a little lace and then a little more stockinette. Not to mention the fact that is extremely stylish and easy to wear. The best part…it has pockets! I love pockets. 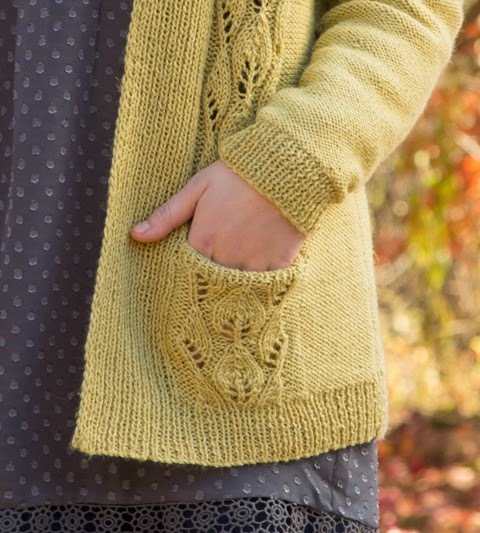 This cardigan has already become a staff favorite. I know of two that are on needles and quite a few of us have it in our (mental) queues. Another great transitional yarn is Magnolia. I have a predisposition to loving this yarn for the name alone. I spent my college years in the south and I can personally attest to how beautiful the magnolia trees are…they look great with or without the blooms and they smell amazing. So it didn’t surprise me one bit that I love this yarn as much I love the foliage. It also doesn’t surprise me that I adore the Apple Cider wrap from Deborah Helmke. This is one of those pieces that is more than a wrap, but not quite a cardigan. Starting at the lower back hem, it’s knit in one piece up and over the shoulders, where it is split for the front. After binding off, there is a small seam on each side to work, weave in your ends and you are done! Or leave the seams unsewn and let it fall over your shoulders (you may want to still weave in your ends though). Perfect for throwing on as you are heading out the door on those days where you need just a little extra warmth or something to block the wind. You may have noticed that both of these pieces have a leaf motif. In fact…all of the pieces in our book Autumn Leaf do! This book is full of amazing pieces that are perfect to knit now, and wear as soon as you are finished. Check out them all out here. As soon as I saw the picture for the Grandpa Cardigan from Joji Locatelli I knew I had to make it. And I knew exactly what I was going to make it out of! Liberty Wool is a great yarn for kids and blankets, and it makes beautiful sweaters for adults too! While the print colors of Liberty Wool are awesome, we also have lots of amazing solid colors. The stitch definition is perfect for a cabled sweater (a big part of what drew me to this pattern was Joji’s use of cables and the elongated stitch she used to separate them). I ran back to the warehouse to make sure we had enough stock on the color I wanted and sure enough we did! Joji uses a unique top-down construction in most of her patterns, that incorporates set-in sleeves, and this is no exception. You start with a provisional cast on and make one of the shoulders (only a few rows) and the do the same for the other side. After the shoulders are completed you connect the shoulders with a cast on for the back in. From there you work down to the armholes, using some increases to shape the back. She then instructs you to remove your provisional cast-on from one of the shoulders and work the front to the armhole, and repeat for the other side. From there the pieces are joined to work in one piece until the hem. Unless you are like me and decide to experiment with adding pockets. I honestly kind of made it up as I went, and got lucky that it seems to have worked. The basic principle of what I did was split the front from the back, worked the fronts as is, except changing the three stitches on the side where the pocket would lie to garter instead of reverse stockinette. For the back I cast on a few stitches on each side of the piece until the pocket linings were wide enough and then continued knitting until the length matched the fronts. Once the back and fronts were the same length I knit across the first front until the spot where the pocket linings would lay and knit one stitch from the front and one stitch from the back together to create a ‘seam’ for the bottom of the pocket. Have I lost you yet? Pockets on the correct side and the wrong side. I will have a better idea of how well it worked when the ribbing is done and the piece is off the needles…which hopefully will be soon. After the ribbing, all I have left is the collar and the sleeves (which are picked up at the armhole and knit in the round down to the cuff)…which is still a lot. But I really can’t wait to be able to wear this sweater. I see it as my go-to sweater in the fall - the one you pull on when it’s just a touch chilly outside and you need an extra layer (but don’t want a coat yet), the one that you pull on Saturday morning while easing into your day with a cup of coffee or tea and yet still will be able to wear it to the office with a skirt. And best of all…it’s pink! What’s a Knitter to Do?